Delaying when you start collecting Social Security benefits in the USA can enhance your personal financial situation. You may start collecting benefits at 62, but each year you delay collecting increases your payment by 5% to 8% (see below). If you retire before your “normal social security retirement age” (see below) your payments are reduced from the calculated monthly payment (which is based on your earnings and the number of years you paid into the social security fund). If you delay past that age you get a 8% bonus added to your monthly payment for each year you delay. The correct decision depends on your personal financial situation and your life expectancy. The social security payment increases are based on life expectancy for the entire population but if your life expectancy is significantly different that can change what option makes sense for you. If you live a short time you won’t make up for missing payments (the time while you delayed taking payments) with the increased monthly payment amount. The “normal social security retirement age” is set in law and depends on when you were born. If you were born prior to 1938 it is 65 and if you are born after 1959 it is 67 (in between those dates it slowly increases. Those born in 1959 will reach the normal social security retirement age of 67 in 2026. The social security retirement age has fallen far behind demographic trends – which is why social security deductions are so large today (it used to be social security payments for the vast majority of people did not last long at all – they died fairly quickly, that is no longer the case). The way to cope with this is either delay the retirement ago or increase the deductions. The USA has primarily increased the deductions, with a tiny adjustment of the retirement age (increasing it only 2 years over several decades). We would be better off if they moved back the normal retirement age at least another 3 to 5 years (for the payment portion – given the broken health care system in the USA retaining medicare ages as they are is wise). In the case of early retirement, a benefit is reduced 5/9 of one percent for each month (6.7% annually) before normal retirement age, up to 36 months. If the number of months exceeds 36, then the benefit is further reduced 5/12 of one percent per month (5% annually). For delaying your payments after you have reached normal social security retirement age increases payments by 8% annually (there were lower amounts earlier but for people deciding today that is the figure to use). Social security increases the monthly payment each year by the calculated inflation rate – I am going to ignore that in the example (to make my life easier). Lets say your normal retirement age is 65 and your calculated monthly payment was $1,000. If you start collecting at age 65, after 13 years you have received $156,000. If you delayed for 2 years and started collecting when you were 67 after 11 years of payments (so to the same age of 78) you have received $153,965 (and your monthly payment each month is 16% higher than under the original scenario – so the longer you live the more you make). So in this example it takes a bit over 13 years to break even for delaying by 2 years (while in reality thing are a bit more complicated this is a decent estimate). The life expectancy of for a man in the USA at age 65 is 19 years and for a woman is 21 years. So on average people will make a great deal more by delaying the start of social security payments, given the current rules (Congress can change the rules so this may change in the future). If someone is sickly and unlikely to live to the standard life expectancy that may mean delaying the start of payments is not a wise move. One of the great benefits of delaying the payments is that the higher payments until death addresses a big risk in retirement planning – outliving your savings. Since you may have hundreds of more dollars every month for decades that decreases the amount you have to dip into your retirement principle. Since we don’t know how long we will live, a higher monthly annuity payment will provide the most benefit at the time when you face the largest risk for retirement planning, that of outliving your savings. It provides a bit of insurance against outliving your savings – or at least pushes the date at which that happens further into the future. Can you pass a Social Security test? 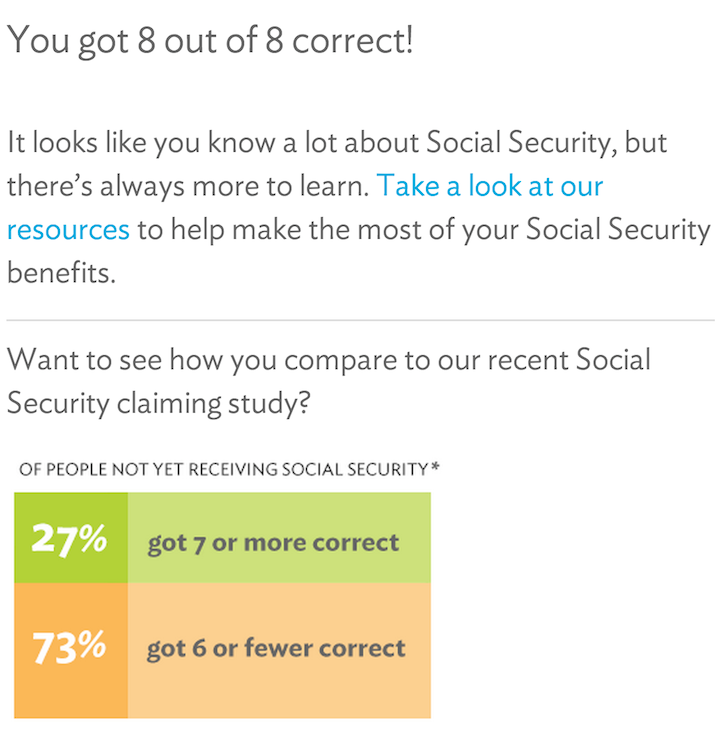 Take this 8 question social security quiz to test out your knowledge.